Sports fans and action sports fans all over the world are gearing up to witness the world’s best athletes coming together on the shores of Bondi Beach, Sydney to celebrate the 10th birthday for Vans BOWL-A-RAMA™ Bondi 2014, the largest professional concrete skateboarding event in the Southern Hemisphere. The weeklong skateboarding festival will run from February 18, 2014 with the competition taking place on Saturday February 22, featuring the world’s most successful and influential skaters. 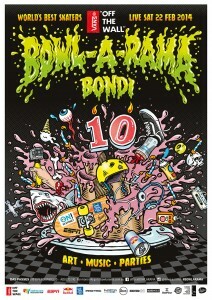 This will include fellow ‘Bones Brigade’ members, Vans legendary skater Steve Caballero, World Champion Pedro Barros and the iconic Tony Hawk; who will be dropping in to help light the candles and compete in Vans BOWL-A-RAMA™ Bondi for the first time. Andy Buckworth spends a day riding in Greenville, NC hitting the ramps of Monster Energy teammates Ryan Guettler and Dave Mirra! Let us know of other great BMX clips… leave a comment below. [Photo credit – Stuart Blythe] A crowd of 58,977 spectators has enjoyed a hot day and hot racing on the streets of the Gold Coast today for the third and final day of the Armor All Gold Coast 600. Today’s crowd brings the Event’s total tally to 170,073 fans across the three days, a result Queensland Sport Minister Phil Reeves said was spectacular. “This Event means jobs, it means tourism, this is too important for the Gold Coast, and with 170,000 odd spectators over three days, that is great for the Gold Coast,” said Minister Reeves. Queensland Treasurer Andrew Fraser echoed the Minister for Sport’s statements. “There isn’t a spectator that was here today that will go home disappointed, or anyone that would have watched that on television and not hung on right to the last lap, that was competitive racing with the best backdrop in Surfers Paradise and it’s a wonderful thing,” said Fraser. Entertaining the spectators today was the second 300 kilometer, 120 lap battle for V8 Supercar glory on the streets, with reigning Champion Jamie Whincup and co-driver Steve Owen taking the honours after a hard-fought race which culminated in a furious battle for the lead between Whincup and Shane van Gisbergen across the final segment. Van Gisbergen eventually crossed the line in second, seeing he and co-driver John McIntyre on the second step of the podium while Mark Winterbottom had a determined drive through the field after a mishap during his pit stop, to see he and his co-driver Luke Youlden claim third today. “That is certainly up there as far as wins, we were a sitting duck there at the end but the car was a long way from yesterday, we reinvited the wheel which is not uncommon in motrsport, a tune up here or a tweak there, a spring change and so on, massive amount of changes last night, and the car was a lot better today,” said Whincup. 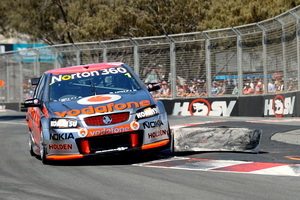 Van Gisbergen was also happy with the battle to the finish although he wasn’t able to stand on the top step. “It was definitely on at the end there and we were trying pretty hard, Jamie was driving really well, it was a great fight and I am pretty happy with the result, I would have been happy with third but second is better!” said van Gisbergen. Priaulx was the highest placed international driver, placing tenth with his driving partner Lowndes in the TeamVodafone machine after they placed second in yesterday’s race, receiving a special trophy for his efforts. Priaulx wasn’t alone in enjoying the weekend’s action, with Castroneves just one of the drivers expressing excitement at the prospect of coming back. “Yes! It’s like Dancing With The Stars – so much fun. I gotta do it,” said Castroneves when asked if he would come back next year if he could. The V8 Supercars weren’t the only cars thrilling the crowd today, with a special trip down memory lane arranged for the fans this morning when the infamous 1977 1-2 Bathurst finish of Alan Moffat and Colin Bond was recreated before their eyes. During their session this morning, the cars did laps for the crowd before the entire field slowed to walking pace, apart from the cars of Moffat and Bond, who continued on at ‘race pace’ to recreate the form finish across the start/finish line. However it wasn’t exactly as before, with the pair changing it up to see Bond cross the line first. “It was great to spend time with the drivers from my era. “The Bathurst Regional City Council and the National Motor Racing Museum must be congratulated for giving up the car for this weekend. Also on track today were the Yokahama V8 Utes, the Hertz MINI Challenge pocket rockets and the Genuine Ford Parts Australia Formula Ford Championship. Taking race wins in the Utes today were Rhys Mc Nally for race two and Grant Johnson for race three, with Chris Pither taking the round honours. In the MINI Challenge and Formula Ford racing it was Glenn Seton and Chaz Mostert respectively who took the race three spoils, with Paul Stokell and Mostert winning the rounds respectively. 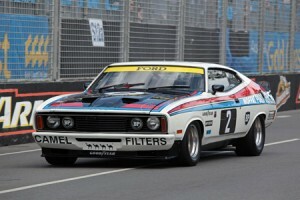 Mostert dominated his category with three wins from three races allowing him to extend his championship lead significantly. 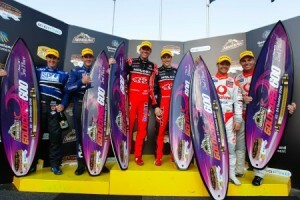 (Photo credit – EDGE Photographics) Day two of the Armor All Gold Coast 600 has delivered all of the breath-taking action anticipated to a crowd of 60,116 fans on the streets of the Gold Coast. The battles started from the very start of the race, with frenetic racing from start to finish ensuring the crowd was kept entertained from start to finish across the 300 kilometer, 120 lap stanza. Tony Cochrane – V8 Supercars Australia Chairman – is on record saying that the Armor All Gold Coast 600 is the ‘party the Gold Coast has to have’, and that party officially started today. Construction has begun on the famous Gold Coast street circuit some five weeks later than usual, a deliberate move to substantially decrease the build time of the shortened layout. The first overhead bridge crossing the Gold Coast Highway was installed this morning, and proudly displays the catch phrase ‘Get the party started’ to Gold Coast travelers as the countdown to the October 22-24 event continues. The Hard Rock brand has once again confirmed its support for international and Australian artists, announcing its support of ‘600 Sounds’ – part of the Armor All Gold Coast 600 – today. The music festival will feature 16 international and Australian acts including Ian Carey, international legends the Beach Boys, Empire of the Sun and Sneaky Sound System at the Broadwater Parklands across three nights October 22-24 as part of the Rock N Race format of the Armor All Gold Coast 600. [Photo credit: Stuart Blythe] The Northern Brisbane Rollers Brawl Stars play host to one of Victoria’s toughest derby teams, the Geelong Bloody Marys, on Saturday 16 October 2010. It’s been almost a year since the Northern Brisbane Rollers (NBR) played their first interstate bout. 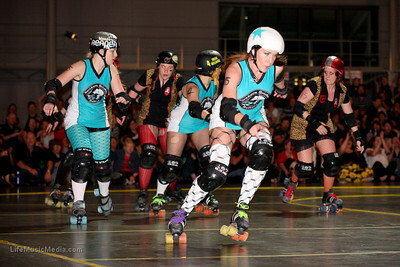 At the ‘Skate of Emergency’ double-header in Adelaide on 27 September 2009 NBR lost to the Adelady Tornadoes by a 40-point margin. Fast forward to Sydney on 22 May this year – NBR travelled south and played in a rather controversial match against the Sydney Roller Derby League. It was a neck and neck encounter until the dying minutes. Final score: Sydney 106 Brisbane 86. THE biggest field for a championship rally in Australia in years, 83 cars, will start the International Rally of Queensland on the Sunshine Coast on Friday 30th July 2010. The final entry list for the 30 July-1 August event features teams from India, Malaysia, Japan, Indonesia, New Zealand, New Caledonia and Australia, plus a star-studded driver line-up. 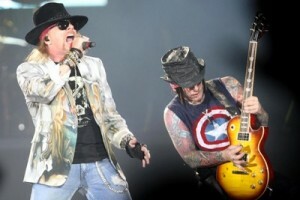 Rock legends Guns n’ Roses to play the 2010 Sydney Telstra 500! Global rock legends Guns N’ Roses will join the high octane charged V8 Supercar Championship Series to combine for a one-off East Coast concert at New South Wales’ premier sporting and entertainment event, the Sydney Telstra 500, at Sydney Olympic Park this December. After an almost embarrassingly easy 2009-10 summer of cricket, Ricky’s boys are understandably looking towards the impending battle agains the old enemy for the most coveted trophy in cricket, The Ashes. Over a century of tradition will descend on Australia for this 5 test series, as 11 men carry the weight of their respective nations on their shoulders. Nothing compares to seeing ball 1, day 1 of an Ashes test so get in early. The five match Ashes Tour in Australia is are now on sale. Buy 1st Ashes Test Day 1: Tickets for 11/25/2010 at The Gabba in Woolloonngabba. Buy 1st Ashes Test Day 2: Tickets for 11/26/2010 at The Gabba in Woolloonngabba. Buy 1st Ashes Test Day 3: Tickets for 11/27/2010 at The Gabba in Woolloonngabba. Buy 1st Ashes Test Day 4: Tickets for 11/28/2010 at The Gabba in Woolloonngabba. Buy 2nd Ashes Test Day 1: Tickets for 12/03/2010 at Adelaide Oval in North Adelaide. Buy 2nd Ashes Test Day 2: Tickets for 12/04/2010 at Adelaide Oval in North Adelaide. Buy 2nd Ashes Test Day 3: Tickets for 12/05/2010 at Adelaide Oval in North Adelaide. Buy 2nd Ashes Test Day 4: Tickets for 12/06/2010 at Adelaide Oval in North Adelaide. Buy 3rd Ashes Test Day 1: Tickets for 12/16/2010 at WACA Ground in East Perth, WA. Buy 3rd Ashes Test Day 2: Tickets for 12/17/2010 at WACA Ground in East Perth, WA. Buy 3rd Ashes Test Day 3: Tickets for 12/18/2010 at WACA Ground in East Perth, WA. Buy 3rd Ashes Test Day 4: Tickets for 12/19/2010 at WACA Ground in East Perth, WA. Buy 4th Ashes Test Day 1: Tickets for 12/26/2010 at Melbourne Cricket Ground in Melbourne, VIC. Buy 4th Ashes Test Day 2: Tickets for 12/27/2010 at Melbourne Cricket Ground in Melbourne, VIC. Buy 4th Ashes Test Day 3: Tickets for 12/28/2010 at Melbourne Cricket Ground in Melbourne, VIC. Buy 4th Ashes Test Day 4: Tickets for 12/29/2010 at Melbourne Cricket Ground in Melbourne, VIC. Buy 5th Ashes Test Day 1: Tickets for 01/03/2011 at Sydney Cricket Grounds in Sydney, NSW. Buy 5th Ashes Test Day 2: Tickets for 01/04/2011 at Sydney Cricket Grounds in Sydney, NSW. Buy 5th Ashes Test Day 3: Tickets for 01/05/2011 at Sydney Cricket Grounds in Sydney, NSW. Buy 5th Ashes Test Day 4: Tickets for 01/06/2011 at Sydney Cricket Grounds in Sydney, NSW. [Photo by Greg Weight] The legendary Cold Chisel will headline the 2010 Deniliquin Ute Muster on Saturday 2nd October 2010. 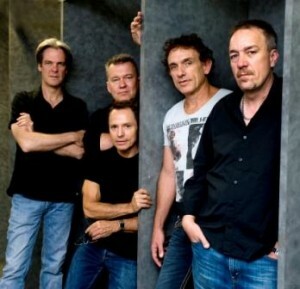 This will be Cold Chisel’s only major performance this year, cementing the Deniliquin Ute Muster as one of Australia’s flagship Festival’s for 2010. With a top class entertainment programme of extreme sports, live concerts and entertainment to suit all ages the Deniliquin Ute Muster is anticipating a sellout prior to the Festival.